Kiteboarding is very popular sport in Punta Cana but not as popular as in Cabarete – the place to go kitesurfing in the Dominican Republic. On many days you will see dozens kiteboards going up and down the beach but there is a lot of place for everyone and there are no jet skis or too many motorboats that would get in the way. During the winter months the winds are quite consistent in Punta Cana. The wind usually blows day and night, starting in mid-November through February. For most of they year the place sees the afternoon winds mostly between 13 to 18 knots (not often over 22 knots) for about 4 hours. Typically you can you can rig up right in front of your hotel. There is quite a bit of coral in the water which makes it a bit challenging for beginners. The corral ends after about two thirds of a mile out. Punta Cana is not a bad place to learn kiteboarding. Until recently you had to look for a private teacher but now there are at least two schools that teach kite surfing. These schools do group classes or private classes. However you can still get a good deal if you go and ask kitesurfers on the beach to teach you. 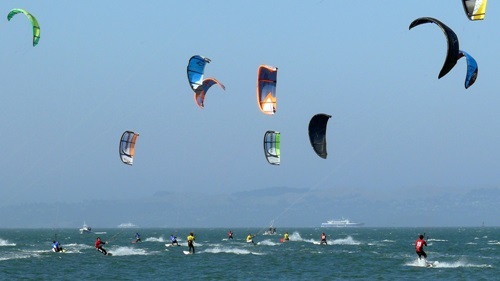 To become an independent kite boarder you will need a minimum of 3 days and 9 to 12 hours of lessons. This will set you back at US$350 to US$799.